Dr Caroline Leaf is a communication pathologist and self-titled cognitive neuroscientist. She is a pseudoscientist of the highest order. She once wrote a PhD. Now she has episodes of her TV show titled “Surviving cancer by using the Mind”. Testimonials are an empty box wrapped in shiny paper and trimmed with a bow. They look really good but offer nothing of substance. They’re simply an old advertising trick. Who can argue with a person who says that Dr Leaf helped turn their life around? Saying anything negative just makes you sound like a cynical old boot. And that’s the real problem, because while publishing a whole bunch of positive stories is good for marketing, it makes it very hard for those who had a genuinely bad experience to say anything. No one wants to listen to those people whom Dr Leaf has confused or mislead – it makes for terrible PR. Those people feel devalued, and sometimes worse, because it seems like everyone else had a good result from Dr Leaf’s teaching, except them. Testimonials also make for very poor scientific evidence. Indeed, testimonials are considered the lowest form of scientific evidence . It’s all very well and good for a bunch of people to share their positive experiences, but as life changing as the experience may have been, they are not evidence of the effectiveness of Dr Leaf’s teaching. Without specific, well-designed research, no one can say if the testimonials Dr Leaf is publishing are the norm. 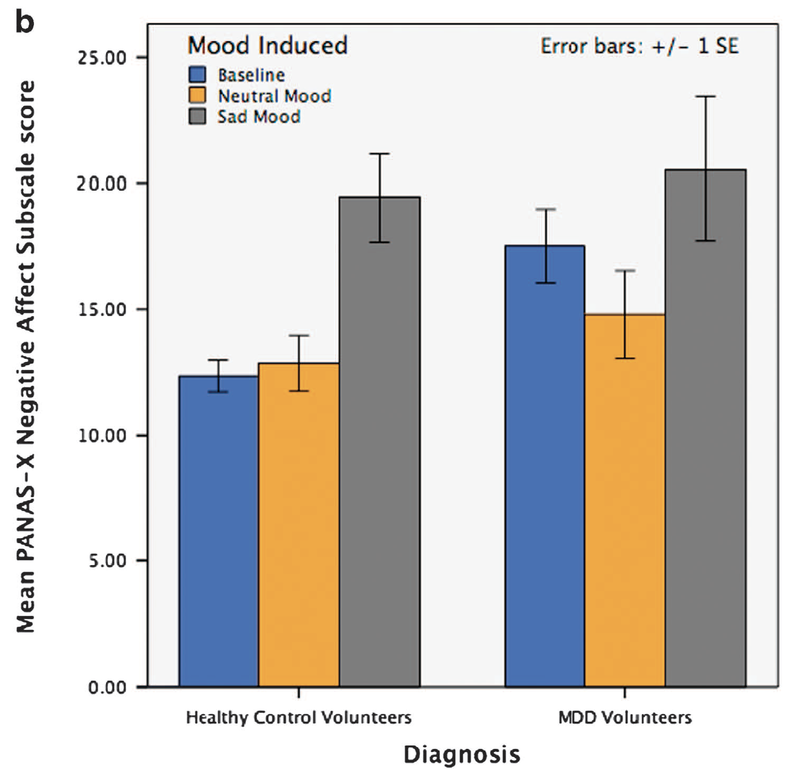 Recent research demonstrates that self-help literature for depression may not have any benefit over a placebo treatment . So it may be that any improvement attributed to Dr Leaf’s teaching was actually the placebo effect. Dr Leaf can list testimonials until she’s blue in the face, but that doesn’t prove that her work is scientific or therapeutic. Indeed, selectively publishing testimonials is duplicitous, telling half-truths, positively spinning her own story. 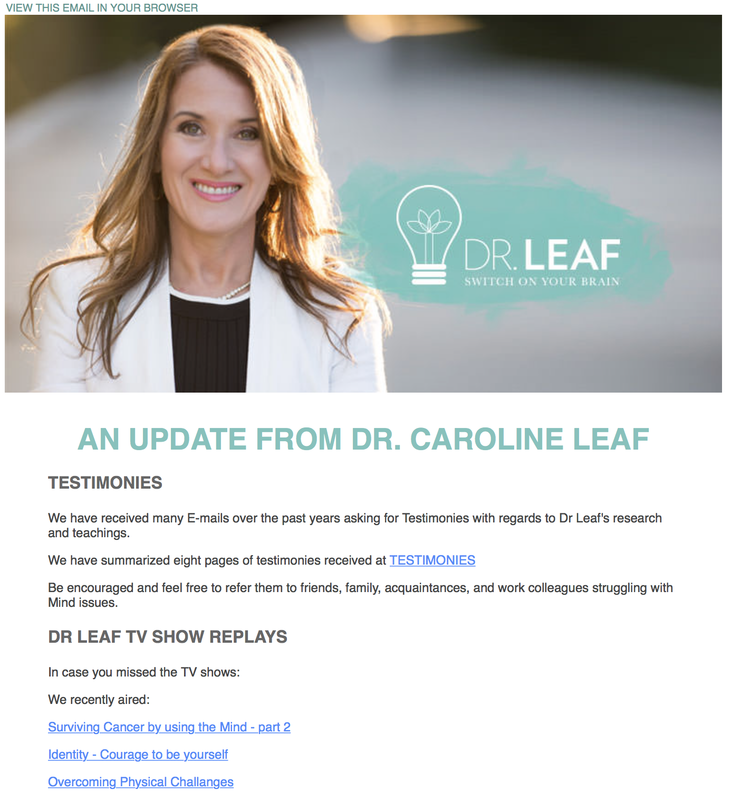 How many e-mails has Dr Leaf gotten from people who have found her teaching inaccurate, ineffective, unbiblical or harmful? Dr Leaf’s social media minions deliberately delete any negative comments and block anyone from her sites that disagree with her. And over the years, many people have shared with me how arrogant and dismissive her team has been to polite, genuine concern or criticism. I can personally attest to the same treatment. If Dr Leaf was honest with her followers, she would be openly publishing the brickbats as well as the bouquets. For her readers and followers, the testimonials need to be seen for what they are: just individual stories. Sure, we should rejoice with those who are rejoicing (Romans 12:15), and so good for those who feel Dr Leaf has helped them. But they do not constitute evidence for the therapeutic efficacy or scientific integrity of the work of Dr Leaf. 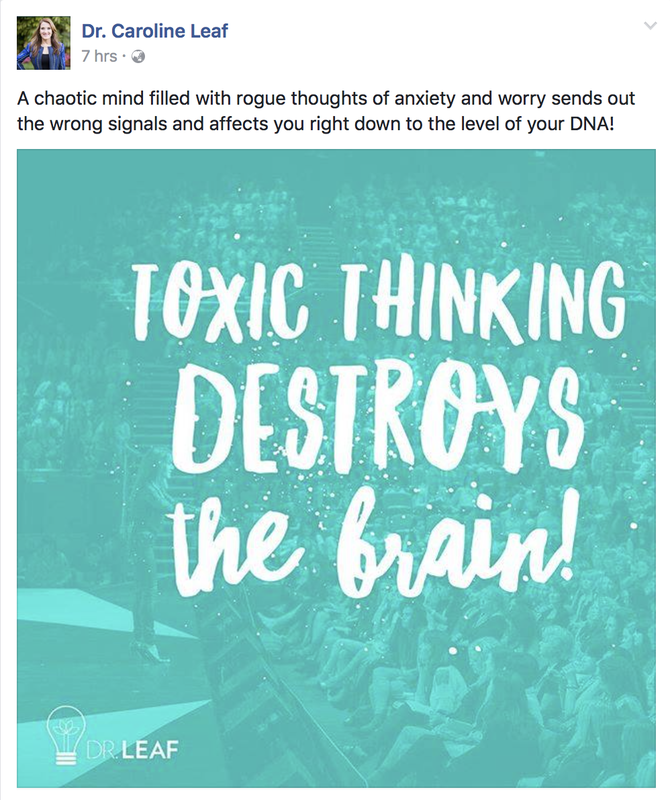 For people genuinely struggling with “mind issues”, the last thing they need is testimonials collated by Dr Leaf’s marketing team. They don’t need to be referred to Dr Leaf’s work, they need to be referred to psychologists and doctors. And if Dr Leaf really wanted to prove her legitimacy, she would rely on independent peer-reviewed published research, not on the list of vacuous, self-serving cherry-picked testimonials that she is currently offering. Marketing Science Institute. Consumer Testimonials as Self-Generated Advertisements: Evaluative Reconstruction Following Product Usage. [cited 2014, Aug 3]; Available from: http://www.msi.org/reports/consumer-testimonials-as-self-generated-advertisements-evaluative-reconstru/. Unless you’ve lived under a rock for the decade, “The Secret” is no secret. We’ve all heard of the book or the movie, or the countless gurus that promote how they’ve made millions of dollars and found untold happiness by unlocking the power of the Law of Attraction. You can have that same success too if you buy their book or attend their seminar, or sign up to be part of their network marketing scheme. Let’s be honest, we’ve probably all, at some point, indulged someone telling us that we just need to think positive or visualise our goal and it will be ours. It’s even something that many preachers over the years have sold to us in various guises, like hyper-faith, name it and claim it, sowing your seed. The Secret claims that if we understand we’re all energy, one with the universe and its power, then we can leverage that power to create or receive anything we want with our thoughts. We just need to think positively and visualise it. It’s a repackaging of the human potential movement, new age philosophy and cosmic consciousness, all of which is a repackaging of pantheism and Eastern religious teaching. 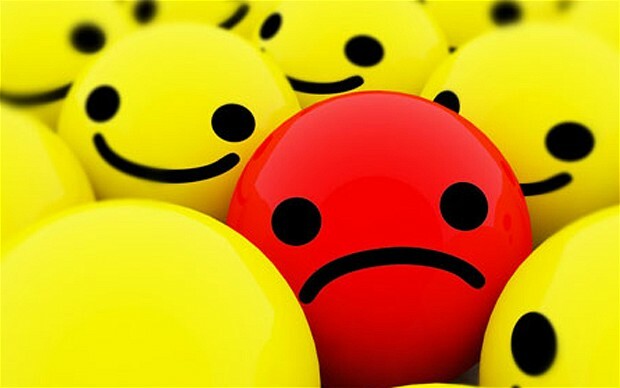 The author, Rhonda Byrne, (who I’m embarrassed to say is Australian) wrote, “If you’re feeling good, it is because you are thinking good thoughts.” Ok, but what about when you’re thinking good thoughts and you still feel bad? What exactly are ‘good thoughts’ anyway? She also wrote, “Remember that your thoughts are the primary cause of everything.” So the rise of ISIS is because of my thoughts. Donald Trump might be President … my thoughts. An oceanic tectonic shift cuts the undersea trunk line taking out the internet for half the eastern seaboard … Sorry, my bad, I was having negative thoughts again. So The Secret really doesn’t make a lot of objective sense. I could go on, but it’s been taken down well enough by a number of commentators and critics over the last decade or so (https://skeptoid.com/episodes/4096; http://www.christianitytoday.com/ct/2007/june/20.71.html), so I’m not going to reinvent the wheel. But suffice to say, The Secret fundamentally sells the power of thought to shape our reality … wait, that sounds oddly familiar. 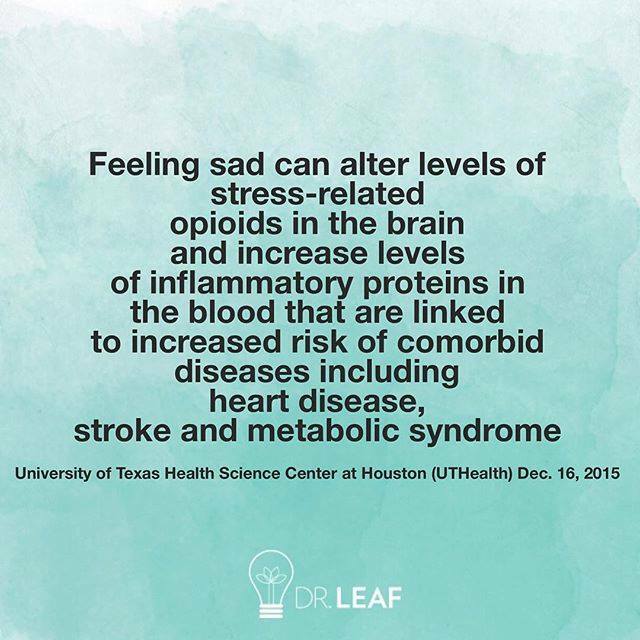 Dr Leaf said the same thing at TD Jakes’ church, the Potter’s House, only this week. The only difference between The Secret and Dr Leaf’s ministry is Dr Leaf’s claim that science and scripture support it, though lexical contortions of scripture, and cherry-picked pseudoscience does not qualify as supporting evidence. In the last ten years since The Secret was published, many critics have lined up to pull it apart, some prominent Christians included. So they should, because The Secret is an abhorrent, unscientific concoction of new age humanism, or as one critic astutely put it, “spiritual narcissism”. I’ve dissected Dr Leaf’s teaching over the last three-and-a-bit years and shown that her science is wanting, and her scripture is tenuous. As this week’s sermon aptly demonstrates, Dr Leaf’s teaching appears to be a lukewarm re-serving of The Secret, sprinkled with some scripture and pseudoscience to try and make it more palatable for the Christian church. 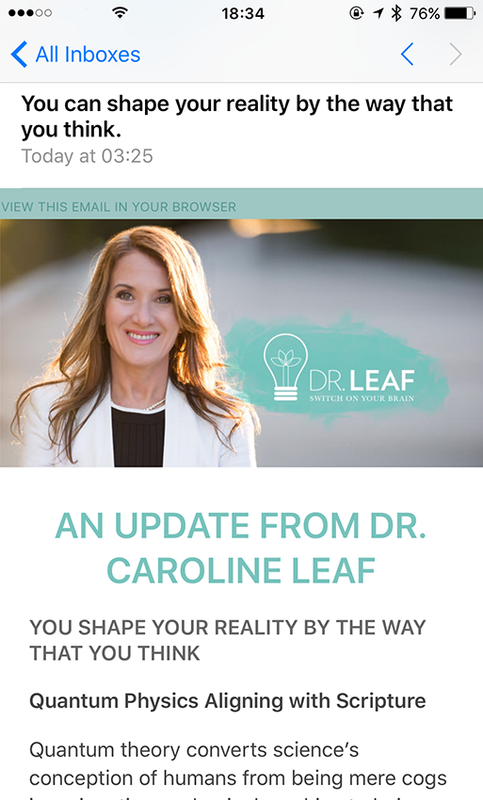 Despite the shared narratives of self-obsession and magical thinking, the Christian church still fawns over Dr Leaf. It’s embarrassing to see the same Christian leaders and media outlets lambaste The Secret but unquestioningly accept the same message woven through Dr Leaf’s teaching. Dr Leaf’s teaching is so close to The Secret I’m surprised Rhonda Byrne hasn’t asked for royalties. “The only thing necessary for the triumph of evil is for good men to do nothing”. The same goes for ignorance—the only thing necessary for the triumph of ignorance is for smart men (and women) to do nothing. We also need consistency. Rejecting The Secret but accepting the same teaching from Dr Leaf creates a cultural cognitive dissonance amongst the Church that’s unhealthy. Church, it’s time to stand against mistruth no matter what the source. Leaf C., Who Switched Off My Brain? Controlling toxic thoughts and emotions. 2nd ed. Southlake, TX, USA: Inprov, Ltd, 2009. Leaf C.M., Switch On Your Brain: The Key to Peak Happiness, Thinking, and Health. Grand Rapids, Michigan: Baker Books, 2013. Leaf C.M., Think and Eat Yourself Smart. USA: Baker Books, 2016. But that’s not what science says. According to modern research, anxiety disorders are the result of a genetic predisposition to increased vulnerability to early life stress, and to chronic stress . The other way of looking at it is that people who don’t suffer from anxiety disorders have a fully functional capacity for resilience [2,3]. Dr Leaf’s teaching is backwards. Perhaps it’s time she turned it around. 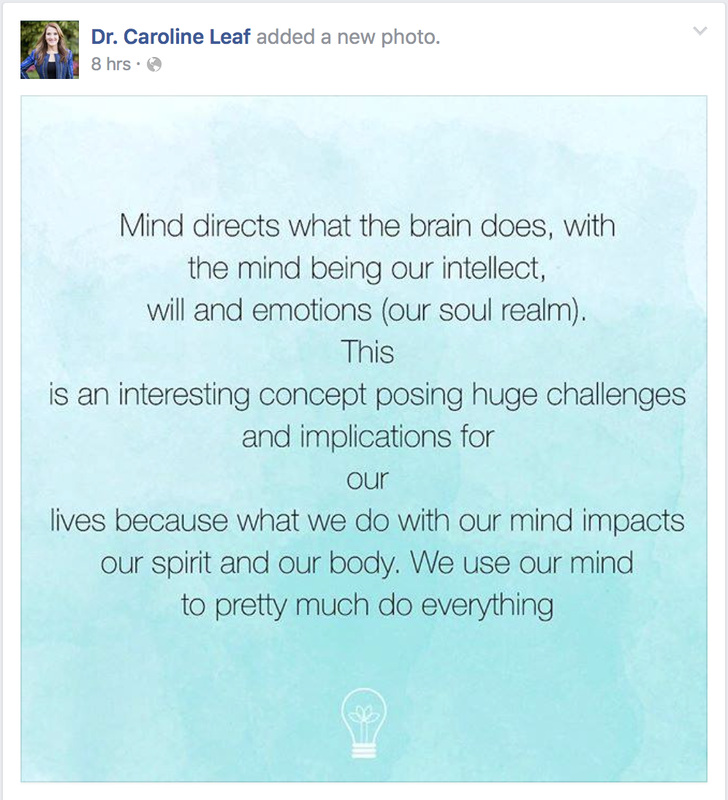 Dr Leaf’s theme for the week is the mind-brain link. 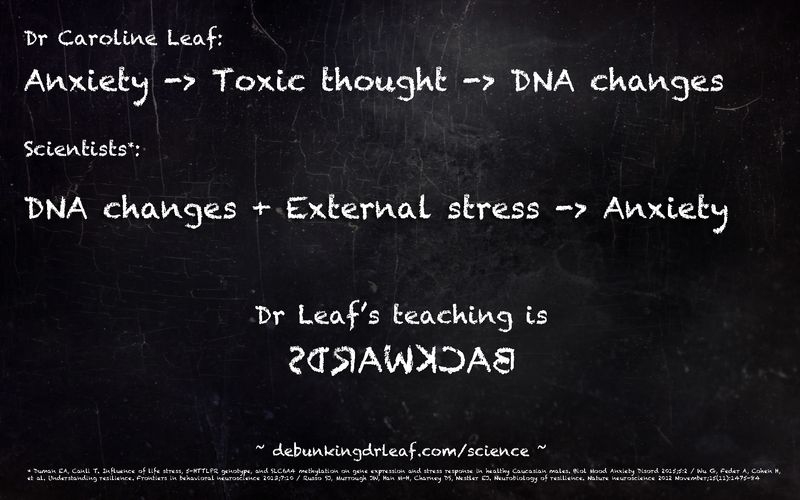 In the last few days, Dr Leaf has posted memes claiming that the brain is seperate from, and subservient to, the mind. Despite evidence to the contrary, she continued the same theme today. Dr Caroline Leaf is a communication pathologist and a self-titled cognitive neuroscientist. Her teaching is strongly influenced by one of her foundational philosophical positions; that the mind (the intellect, will and emotions) controls the body, which includes the brain. While this idea may be popular with philosophers, it’s not with neuroscientists. Not that this bothers Dr Leaf, of course, since she’s not really a neuroscientist. Today’s meme is more or less exactly the same as what she claimed over the previous couple of days, except today’s version is more verbose. At this point, I’m having a strong and nauseating sense of deja vu. I know I’m going to be repeating myself, but to reinforce the message, lets go through Dr Leaf’s meme to show that it hasn’t gotten any righter with repetition. “(The) Mind directs what the brain does” … The relationship of the mind to the brain is like the relationship of music and a musical instrument. Without a musical instrument, there is no music. In the same way, the mind is a product of the brain. It’s not independent from the brain. Without the brain, there is no mind. Indeed, changes to the structure or function of the brain often results in changes to the mind. Yesterday I used the example of medications. Caffeine makes us more alert, alcohol makes us sleepy or disinhibited. Marijuana makes it’s users relaxed and hungry, and sometimes paranoid. Pathological gambling, hypersexuality, and compulsive shopping together sound like a party weekend in Las Vegas, but they’re all side effects linked with Dopamine Agonist Drugs, which are used to treat Parkinson’s disease. If a pill affecting the brain can change the function of the mind, then it’s clear that the mind does not direct what the brain does. “This is an interesting concept posing huge challenges and implications for our lives because what we do with our mind impacts our spirit and our body” … The relationship between our body, mind and spirit is interesting. I’ve written about this before in an essay on the triune being and dualism. But there are no great challenges here or implications here. If anything, knowing that our thoughts don’t have any real power over us is incredibly freeing. Rather than increasing our psychological distress in trying to suppress or control our thoughts, we can step back and focus on committed actions based on our values. So no matter which way Dr Leaf says it, it simply isn’t true that the mind controls the brain. As I said in my previous post, this is a fatal flaw for Dr Leaf’s teaching. That she keeps using this trope is entirely her choice and her right, but it certainly doesn’t aid her reputation as a credible neuroscientist. Have you ever found yourself about to give a speech or sit an exam, and one of your friends tries to calm you down by saying, “Stop worrying … just don’t think about it!” Does that ever work? Not usually! The more you try to intentionally block it from your mind, the more it wants to pop up again. Why is that? It seems intuitive that if you don’t want to think about something, all you need to do is to take control and block it out of your mind, right? “Saito: If you can steal an idea, why can’t you plant one there instead? This is a great little dialogue about thought suppression. Thought suppression is the process of consciously trying to avoid certain thoughts, either by trying to replace the unwanted thought with another thought, or simply trying to repress the unwanted thought. Our minds tend to focus on the content of a subject. If the subject is elephants, no matter what words I put in front of it, your mind will think about elephants. Like if I say, “I love elephants, or I say “Don’t think about elephants”, your brain hears, “blah blah blah elephants.” And having been sensitized to the idea of not thinking about elephants, when your mind inevitably brings it up again, you’re primed to pay even more attention to it, “D’oh, I’ve just thought about elephants again … stop thinking about elephants …”. This phenomenon is even more pronounced if your mind has already been focusing on the subject. If you’re mind is going over and over a speech you have to give and I say, “Oh, don’t worry about that speech”, all your mind registers is, “blah blah blah SPEECH”. Although it’s been discussed in the psychological sciences for decades, it’s only been since the late 1980’s that considerable attention has been given to the concept of thought suppression. Despite our natural tendencies to try it or recommend it to people, the conclusion of nearly all the research is the same: thought suppression doesn’t work. I’m not really sure why we naturally gravitate to thought suppression. Perhaps it’s part of our natural delusion of control. Perhaps it’s a throwback from the pop-psychology assumptions that we can control our destiny, or the common myth that our mind is in control of our brain. We naturally struggle to suppress intrusive thoughts because intrusive thoughts are normal. Trying to suppress them is like trying to suppress any other normal biological process. Try to stop breathing for any length of time and you’ll see what I mean – it’s impossible, and trying is simply counterproductive. The key is how we react to or feel about our thoughts. If we feel like our thoughts might be somehow causing us harm, then our failure to stop them from bubbling up to the surface of our consciousness is going to cause us distress. It’s a double whammy – we’re stressed because we’re expecting the negative consequences of our thoughts, and we’re distressed by our ‘failure’ to stop them. Since it first started more than a century ago, the death toll from the famous Pamplona event, “Running of the Bulls” currently stands at 13. Countless others have been gored and trampled. Who are the people who get injured during the event? Certainly not the smart ones standing behind the barriers on the edge of the streets, or the ones watching it broadcast on TV? Only the morons who try to outrun the pack of foot-long bony skewers attached to the half-ton lumps of very cranky steak. Similarly, the best way to manage our thoughts is to learn not to fight with them in the first place. By non-judgmentally observing them, we can simply observe our thoughts for what they are … just thoughts. By stepping back from our thoughts and giving them room, we find that they don’t have any real power over us. Stepping back away from our thoughts and letting them be is the skill of defusion, one part of the process of psychological acceptance. It’s the first step in living a life abundant in meaning and significance. Wenzlaff RM, Wegner DM. Thought suppression. Annual review of psychology 2000;51(1):59-91. Magee JC, Harden KP, Teachman BA. 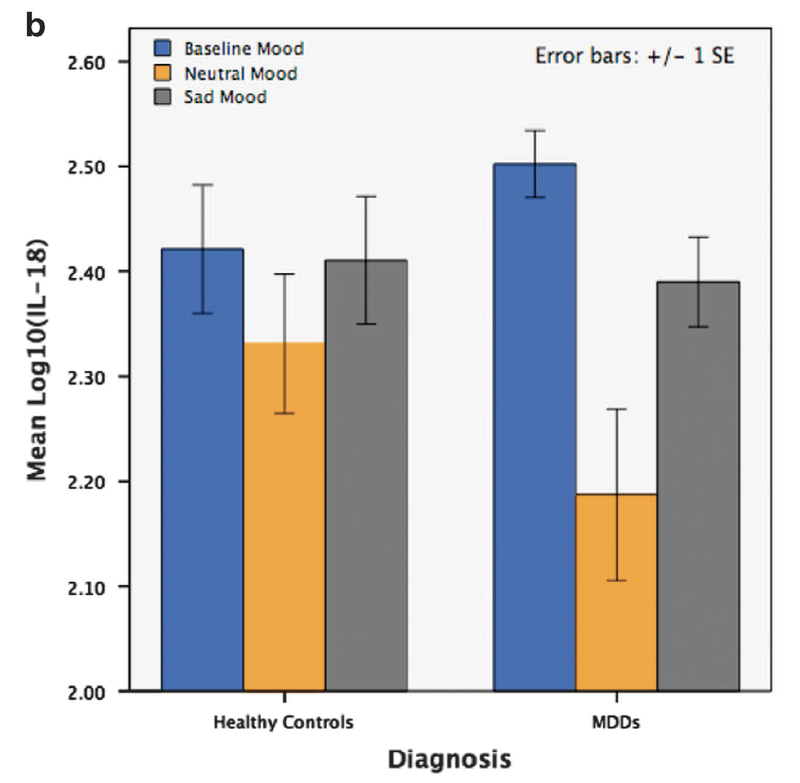 Psychopathology and thought suppression: a quantitative review. Clinical psychology review 2012 Apr;32(3):189-201.